Jeffrey M. Perloff is a professor in the Department of Agricultural and Resource Economics at the University of California at Berkeley. His economic research covers industrial organization, marketing, labor, trade, and econometrics. His textbooks are Modern Industrial Organization (coauthored with Dennis Carlton) and Microeconomics: Theory and Applications with Calculus. He has been an editor of Industrial Relations and an associate editor of the American Journal of Agricultural Economics. He is an associate editor of the Journal of Productivity Analysis and edits the Journal of Industrial Organization Education. He has consulted with nonprofit organizations and government agencies (including the Federal Trade Commission and the Departments of Commerce, Justice, and Agriculture) on topics ranging from a case of alleged Japanese television dumping to the evaluation of social programs. He has also conducted research in psychology. He is a fellow of the American Agricultural Economics Association. He received his B.A. in economics from the University of Chicago in 1972 and his Ph.D. in economics from the Massachusetts Institute of Technology in 1976. He was previously an assistant professor in the Department of Economics at the University of Pennsylvania. Students need to learn two skills in this course: they need to master the requisite micro theory, and at the same time develop their problem-solving skills. 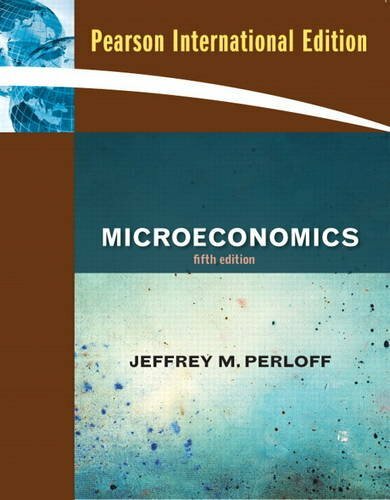 Microeconomics has become a market leader because Perloff presents theory in the context of real, data-driven examples, and then develops intuition through his hallmark Solved Problems. Students gain a practical perspective, seeing how models connect to real-world decisions being made in today’s firms and policy debates. The Fifth Edition reflects critical developments in the field, including a new chapter on game theory (Chapter 14), expanded coverage of behavioral economics, and the latest data and applications. It is easy to encourage students to practice working problems with MyEconLab, the online homework and tutorial system. New to the Fifth Edition, MyEconLab now includes exercises and Solved Problems pulled right from the book, as well as Economics Videos featuring ABC News. For a calculus-based microeconomics course, consider Perloff’s new text, Microeconomics: Theory and Applications with Calculus.